bellocq. tempura edible flowers. chinese tea eggs and tea salt. We always plant a bed of edible flowers in our garden upstate to add to salads or to eat straight from the garden. So, I was super inspired when we shot our favorite tea atelier, Bellocq, for the most recent issue of Kinfolk. 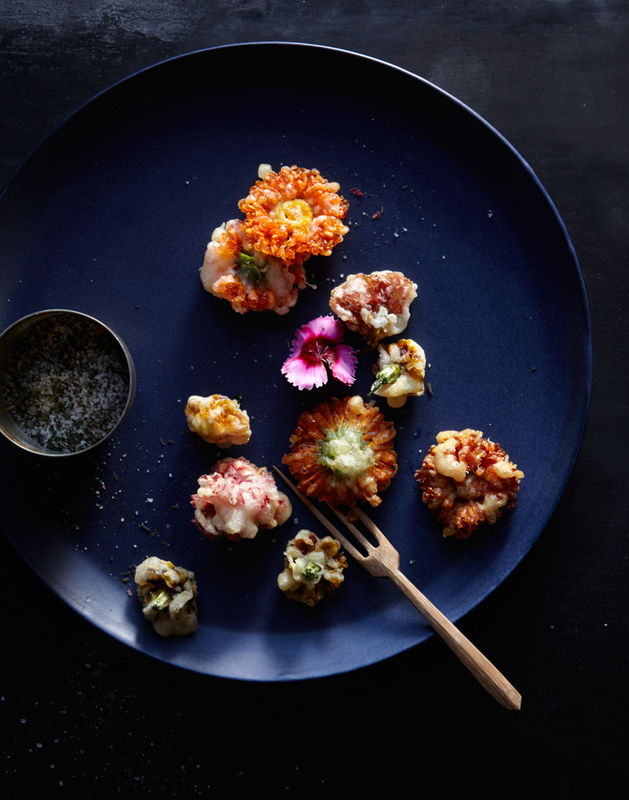 Heidi Johannsen Stewart of Bellocq came up with this brilliant idea to tempura edible flowers and to serve them with tea salt! They were so good and so beautiful! We ate and drank a lot of tea inspired foods that day. We also made Chinese tea eggs and paired it with the same tea salt. I will share them soon! Have a great weekend! If you are going to try this make sure you have done your research as to what flowers are edible! Never use anything that has been sprayed! Tea salt can add an interesting flavor to just about anything you are cooking. We used a smokey tea for this one! (no. 19 Lapsang Souchong) Organic black tea scented with pinewood smoke. Plucked at high elevations in the Wuyi Mountains, this tea has a distinctive earthy flavor, with strong notes of honey and a rich red liquor. You can order this tea online from Bellocq. Chinese Tea eggs are a populaur street food in China. I never ate them while I was there because I kind of avoid street food whle working. They were super beautiful however and stayed in my mind long after the trip. Most recipies for Chinese Tea Eggs call for the eggs to be steeped in a combination of black tea, star anise, cinnamon, soy sauce and black pepper but you can get creative and add bits of citrus or ginger. We served these with another fragant tea salt. We used Kiykuya from Bellocq. 1/2 cup loose black tea. We used Keemun Panda from Bellocq. A Organic full bodied black tea, prized for it's sweet earthy flavor and floral notes with a touch of smokiness. You can use any black tea. Combine your eggs, spices and soy sauce in a large non-reactive pot with enough water to cover the eggs. Simmer your eggs for an hour. Remove the eggs from the liquid and set them aside to cool. Reserve the liquid and spices. (you will later add the eggs to the cooled liquid.) When the eggs are cool enough to handle, gently crack the hard-boiled eggs with the back of a spoon all over the surface of the egg but not hard enough to remove the shell. Gently place the cracked hard-boiled eggs in the cooled spices and liquid in a big lidded jar and refrigerate for three days. The liquid will steep in through the cracks and flavor and stain the white of the egg. The outside will become a beautiful brown. I used Aracauna eggs so that when I cracked them, the shell on the inside would be blue. The outside of the egg took on the most perfect Wedgewood brown. I couldn't help but think that Martha just might fall in love with that color. Heidi and Michael saved the pieces of the egg shell and added them to their famously beautiful Bellocq tableaus.